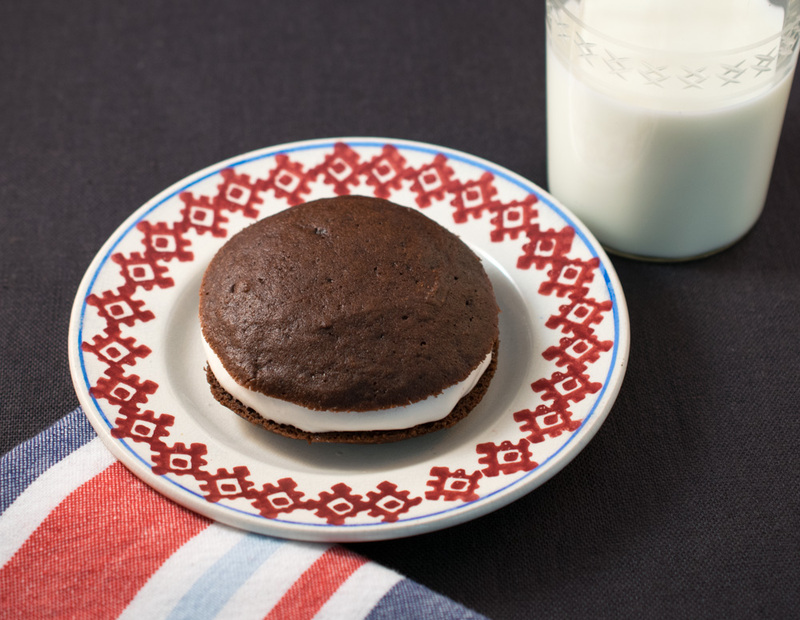 I first tasted Whoopie Pies a few weeks ago, and soon thereafter learned that they are Maine’s official “state treat”. I liked them but I thought I would like them even more if I made them myself. I studied various recipes and this combination is my favorite. It is not as cake-like as others I have seen, and the filling is less sweet than most. The chocolate Whoopie Pie layers make a great chocolate cake! I love the tanginess from the buttermilk and the slight crispness on the edge of the cookie. I made and prefer the smaller version of the Whoopie Pie, but included instructions for the larger version as well. They are really fun to make and they don’t last long once assembled! Of course this “state-treat” is not to be confused with the official Maine dessert being blueberry pie, which will be coming soon to Mead Meadow. Lightly butter 3 baking sheets. In a small bowl, mix the flour, cocoa, baking soda, and salt until combined. Set aside. In a small bowl stir the buttermilk and vanilla together. Set aside. With a stand-up mixer with the paddle attachment, beat the butter and brown sugar at a medium high speed until pale and fluffy, about 3 minutes. If you are using a handheld mixer, beat for about 5 minutes. Then add egg, beating until well combined. Reduce speed to low and alternately mix the flour mixture with the buttermilk in batches, beginning and ending with the flour. Scrape down the sides of the bowl and mix until smooth. Using a 1¼ inch ice cream scoop, place mounds of batter about 2 inches apart onto prepared baking sheets. Bake in upper and lower thirds of the oven. Switching positions of sheets after 6 minutes. Bake until tops are puffed and cakes spring back when touched. About 12 minutes total. CAREFULLY transfer the cookies with a metal spatula to a rack to cool completely. In a stand-up mixer bowl or a handheld mixer with the whisk attachment, at a medium speed, beat together the butter, confectioners sugar, marshmallow, and vanilla until smooth, about 3 minutes. Spread a rounded tablespoon of filling on the flat half of the cakes and top with the remaining cake halves. Wrap individually in plastic wrap, till ready to serve. Make sure you place the dough at least 2 inches apart on the baking sheet, otherwise, they will run together. Be sure you allow the cakes to cool completely before you add the filling. Marshmallow Fluff is a New England ingredient, available in certain parts of the country. If you cannot find Fluff, you can use marshmallow creme. It is thinner in consistency than Fluff and you may need to add a bit more confectioners sugar (powdered sugar) to make it stiffen up sufficiently. It helps to spray your measuring cup before you measure the Fluff, it makes it easier to get it out of the cup. Use ¼ cup of cake batter on the prepared baking sheets or use a 2 inch diameter ice cream scoop. Bake in upper and lower thirds of the oven, switching positions of sheets after 8 minutes. Bake about 15 to 16 minutes, about 8 minutes on each rack in the oven.